Cozumel (Spanish pronunciation: [kosu'mel], Yucatec Maya: Kùutsmil) is an island and municipality in the Caribbean Sea off the eastern coast of Mexico's Yucatán Peninsula, opposite Playa del Carmen, and close to the Yucatán Channel. The municipality is part of the state of Quintana Roo, Mexico. The economy of Cozumel is based on tourism, with visitors able to benefit from the island's balnearios, scuba diving, and snorkeling. 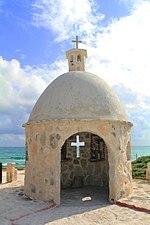 The main town on the island is San Miguel de Cozumel. The name Cozumel was derived from the Mayan "Cuzamil" or "Ah Cuzamil Peten" in full, which means "the island of swallows" (Spanish: Isla de las Golondrinas). The island is covered with mangrove forest which has many endemic animal species. Cozumel is a flat island based on limestone, resulting in a karst topography. The highest natural point on the island is less than 15 m (49 ft) above sea level. The cenotes are deep water-filled sinkholes formed by water percolating through the soft limestone soil for thousands of years. Cozumel's cenotes are restricted to qualified cave divers with appropriate credentials. There are three rodents that are larger than their mainland counterparts: Oryzomys couesi, Peromyscus leucopus, and critically endangered Reithrodontomys spectabilis, the latter of which is also endemic to the island. Cozumel has tropical savanna climate under the Köppen climate classification that closely borders on a tropical monsoon climate. The dry season is short, from February to April, but even in these months precipitation is observed, averaging about 45 millimetres (1.8 in) of rain per month. The wet season is lengthy, covering most of the months, with September and October being the wettest months, when precipitation averages over 240 millimetres (9.4 in). Thunderstorms can occasionally occur during the wet season. Temperatures tend to remain stable with little variation from month to month though the temperatures are cooler from December to February with the coolest month averaging 22.9 °C (73.2 °F). Owing to its proximity to the sea, the island is fairly humid, with an average humidity of 83%. The wettest recorded month was October 1980 with 792 millimetres (31.2 in) of precipitation and the wettest recorded day was June 19, 1975, with 281 millimetres (11.1 in). Extremes range from 9.2 °C (48.6 °F) on January 18, 1977 to 39.2 °C (102.6 °F). The Maya is believed to have first settled Cozumel by the early part of the 1st millennium AD, and older Preclassic Olmec artifacts have been found on the island as well. The island was sacred to Ix Chel, the Maya Moon Goddess, and the temples here were a place of pilgrimage, especially by women desiring fertility. There are a number of ruins on the island, most from the Post-Classic period. The largest Maya ruins on the island were near the downtown area and have now been destroyed. Today, the largest remaining ruins are at San Gervasio, located approximately at the center of the island. Cruise port in San Miguel de Cozumel; the ship pictured is the Celebrity Equinox. Scuba diving is still one of Cozumel's primary attractions, mainly due to the coral reef on the western shore of Cozumel. These coral reefs are protected from the open ocean by the island's natural geography. In 1996, the government of Mexico also established the Cozumel Reefs National Marine Park, forbidding anyone from touching or removing any marine life within the park boundaries. Despite the importance of healthy reefs to Cozumel's tourist trade, a deepwater pier was built in the 1990s for cruise ships to dock, causing damage to the reefs, and it is now a regular stop on cruises in the Caribbean. Over the past few decades, coral reef health has significantly declined in Cozumel, with much lower coral cover now present than was historically recorded. Other water activities include para-sailing, kitesurfing, and a tourist submarine. There are also two dolphinariums. At the cruise ship docks, there are several square blocks of stores selling Cuban cigars, jewellery, T-shirts, tequila, and a large variety of inexpensive souvenirs. There are three universities on the island: the State Public University of Quintana Roo (UQROO) and two private universities, the Partenon Institute and the Interamerican University for Development (UNID). In addition to teaching English as a degree program, they offer other career options including natural resources research, tourism and commercial systems. The Cozumel Carnival or Carnaval de Cozumel is one of the most important carnival festivities in México. It has been celebrated as a tradition beginning from the late nineteenth century and fills Cozumel’s streets with parades. It begins the week before Mardi-Gras in February. Cozumel's Carnaval is a tradition which has been passed down through many generations that celebrates a mixture of cultures that escaped to the warm embrace of Cozumel. Dating back to the mid-1800s, Cozumel Carnaval was started by young people dressed in vibrantly colorful costumes known as "Estudiantinas" or "Comparsas", who expressed themselves in the streets of Cozumel through the artforms of dance, song, and fantasy. ^ "Parque Nacional Arrecifes de Cozumel". Ramsar Sites Information Service. Retrieved April 25, 2018. ^ "Manglares y Humedales del Norte de Isla Cozumel". Ramsar Sites Information Service. Retrieved April 25, 2018. ^ "Cozumel". Enciclopedia de los Municipios de México (in Spanish). Secretaría de Gobernación. Archived from the original on June 12, 2013. Retrieved April 13, 2013. ^ Holt, Patricia A. (2005). Cozumel : the complete guide. New York: iUniverse. pp. ix. ISBN 978-0-595-36995-9. ^ "2010 census tables: INEGI". Mapserver.inegi.org.mx. Archived from the original on May 2, 2013. Retrieved December 23, 2012. ^ "Land area of islands in Mexico: INEGI". Archived from the original on May 12, 2013. Retrieved November 1, 2009. ^ "Cozumel Fox" (PDF). Archived from the original (PDF) on November 13, 2012. Retrieved March 11, 2013. ^ "Coatis, Pisotes, or Coatimundis" (PDF). Archived from the original (PDF) on November 12, 2012. Retrieved March 11, 2013. ^ "Cozumel Pygmy Raccoon" (PDF). Archived from the original (PDF) on November 13, 2012. Retrieved March 11, 2013. ^ a b c d e "Normales climatológicas para Cozumel, Q. ROO" (in Spanish). Colegio de Postgraduados. Archived from the original on February 21, 2013. Retrieved January 5, 2013. ^ Paxton, Merideth (2001). The Cosmos of the Yucatec Maya: Cycles and Steps from the Madrid Codex. University of New Mexico Press. p. 153. ISBN 978-0826322920. ^ Hajovsky, Ric (2015). The True History of Cozumel. Dallas: Pan American Publishing. pp. 147–165. ISBN 9780982861080. ^ Laskowski, Gloriana (July 1, 1999). "Cozumel An Island Paradise - 'Vistas De Cozumel'". Mexconnect.com. Retrieved December 23, 2012. ^ Reyes-Bonilla, Héctor; Millet-Encalada, Marinés; Álvarez-Filip, Lorenzo (2014). "Community Structure of Scleractinian Corals outside Protected Areas in Cozumel Island, Mexico". Atoll Research Bulletin. 601: 1–13. doi:10.5479/si.00775630.601. ^ Gress, Erika; Andradi-Brown, Dominic A. (July 4, 2018). "Assessing population changes of historically overexploited black corals (Order: Antipatharia) in Cozumel, Mexico". PeerJ. 6: e5129. doi:10.7717/peerj.5129. ISSN 2167-8359. ^ "Hurricane Wilma: The areas affected". BBC News. October 25, 2005. Retrieved July 24, 2005. ^ "Species Richness and Community Structure of the Yucatan Marine Reserve Before and After 2005 Hurricane Season". Cmbc.ucsd.edu. Archived from the original on October 30, 2012. Retrieved December 23, 2012. ^ Calvin (March 6, 2007). "Cozumel Reef Conditions Update – 2007". Calvintang.com. Archived from the original on May 28, 2013. Retrieved December 23, 2012. ^ webmaster. "Unidad Académica Cozumel Universidad de Quintana Roo - Universidad de Quintana Roo". www.uqroo.mx. Retrieved March 8, 2016. ^ "Inicio". Instituto Partenón de Cozumel (in Spanish). Retrieved March 8, 2016. ^ "Cozumel". www.unid.edu.mx. Retrieved March 8, 2016. ^ "Cozumel Próximos Eventos - – Fiestas de la Santa Cruz". cozumel.travel. Retrieved March 8, 2016. ^ "Carnaval Cozumel 2016". www.carnavalcozumel.com.mx. Retrieved March 8, 2016. Wikivoyage has a travel guide for Cozumel.